What is Gender-based Violence ? CEDAW (the Committee on the Elimination of Discrimination against Women) defines Gender-based violence (or GBV) as “violence that is directed against a woman because she is a woman or that affects women disproportionately”. It includes “acts that inflict physical, mental or sexual harm or suffering, threats of such acts, coercion and other deprivations of liberty” including “sexual harassment". Because majorities of domestic workers are women, they are very vulnerable to GBV. Generally domestic workers suffer multi-forms of GBV though their stories are often untold. 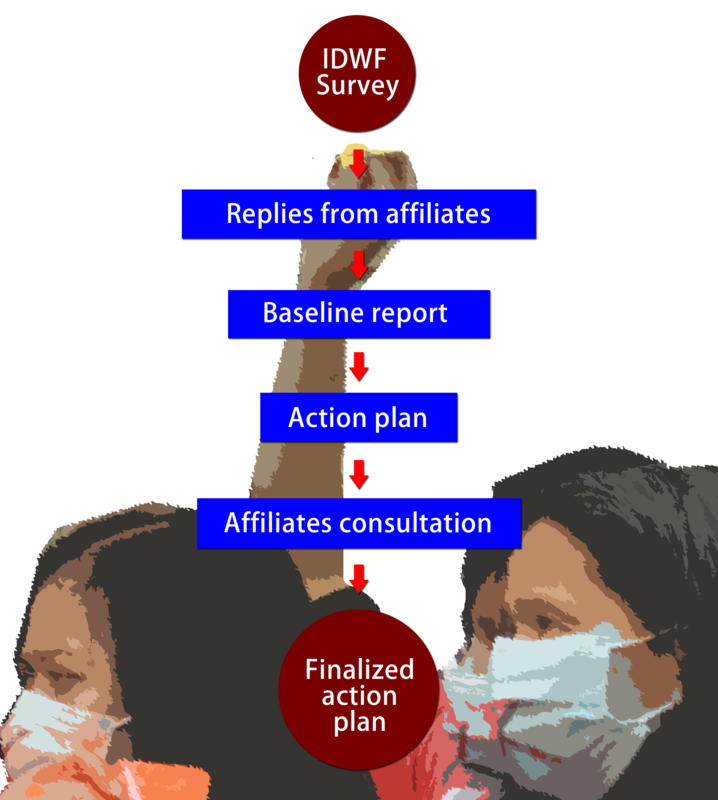 The IDWF has put in its 5-years Strategic Plan to campaign elimination of GBV on domestic workers. From 2017 to 2020, the International Labour Organization (ILO) is working towards an international law on "ending violence and harassment against women and men in the world of work", in a “standard-setting” process. The eventual standard(s) adopted by the ILO may be a binding instrument, known as a Convention; non-binding guidance, known as a Recommendation; or a Convention accompanied by a Recommendation. Our first call to affiliates was to respond to the ILO Questionnaire in August and September. Through this, we told the ILO what domestic workers would want to see in the international law to stop all violence against us. A total of 18 affiliates have sent their replies. They have been combined into a joint responses and sent to the ILO and the key points are as follows. 1) The ILO law should aims at addressing the world of work in a broad way, which should include public spaces and private homes and situations which are work-related. In addition, special consideration must be given to the workers in context of ethnicity, migration and refugees. Workers in the informal economy are often not covered by labour laws. The Convention needs to cover all workers irrespective of their status in a country and whether or not an employment relationship exists. 2) For domestic workers, perpetrators of violence and harassment can be by family members and friends/relatives of the employer, owners and employees of employment/placement agencies and brokers and hence they need to be covered by the Convention. 3) Home-inspection should be included as measures ensuring implementation and monitoring of legislations. Access to courts or tribunals must be free of charge. 4) In the case of migrant domestic workers, they should have the right to remove themselves from a work situation which they have reasonable justification to believe presents an imminent and serious danger of violence and harassment, without suffering undue consequences including consequence of repatriation or deportation. We aim to build capacities of our affiliates to stop GBV and address the issues effectively. This will include achieving an ILO Convention and enabling domestic workers to improve the knowledge and skills in this regard. Meanwhile a survey among its affiliates is being conducted to find out the situation, what have been done and what are the needs. All the responses will go to the formulation of an action plan 2018-2020.